According to the CDC (Centers for Disease Control and Prevention), an estimated 1.5 million new cases of diabetes are being diagnosed among U.S. adults, aged 18 years or older, per year. A large percentage of these individuals, as well as the other 23 million adults already diagnosed, are employed outside the home. Depending on the stage and severity of the disease, many of these will require insulin during their work day, which will may mean giving themselves injections. For the newly diagnosed, this can create a fairly significant level of anxiety that is best dealt with sooner rather than later. Knowing one’s rights and best practices are the first step. Those with diabetes are protected by the ADA (Americans with Disabilities Act), which is enforced in the workplace by the EEOC (Equal Employment Opportunity Commission). Certain levels of privacy and confidentiality are detailed in this legislation, as well as types of reasonable accommodations that should be provided. Because diabetics are “substantially limited in the major life activity of endocrine function” and because their disability can be usually be managed with reasonable accommodation, employers are required to do what is reasonable to facilitate that management. This includes, among other things, “a private area to test their blood sugar levels or to administer insulin injections”. While your employer is required is to accommodate your need for insulin injections during the work day, that does not mean that he can be expected to be psychic. It is the employee’s responsibility to initiate the discussion so that those in charge know what is needed and how to help. Many diabetics will manage their injections, including insulin storage, on their own. Others may require somewhere to keep insulin cool, as well as breaks at other than normal times to do testing, eat a snack or do actual injections. In addition, all will require a safe, hygienic option for disposal of needles, syringes and testing supplies. As long as there is no significant disruption to workplace productivity or unreasonable expense in making these accommodations, employers are not only required to do them but, most often, are more than happy to, especially if the diabetes is leading to bad breath. 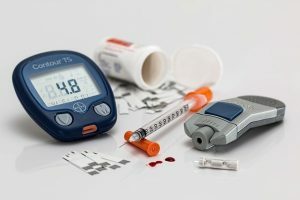 Diabetes has become so prevalent in the U.S., as well as around the world, that it is highly unlikely that you will be the sole employee making these requests. Diabetics learn quickly to be proactive with their care. They monitor and manage their condition, while, at the same time living full lives. These are the kinds of employees that companies need, and smart employers know that. ← Can Medical Marijuana Help with Diabetes?